1. Depending on the number of gift cards you are giving, you will duplicate the inside “pockets” as many times as needed to accommodate your gift cards. You can have the holder vertical or horizontal (both directions are included). 2. VERTICAL: Cut copy paper 5”X4”. 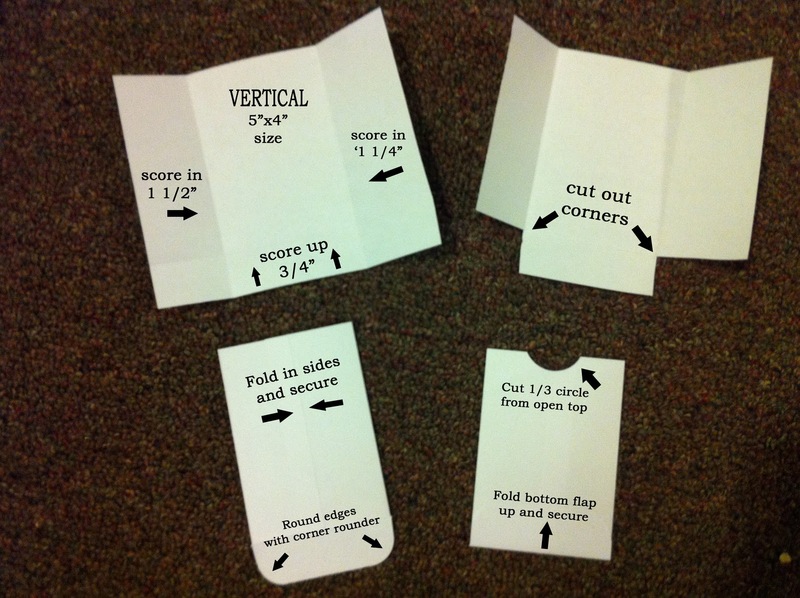 On the 5” side, score and fold 1 ½” in from one side and 1 ¼” in from the other side. Score and fold ¾” up from the bottom. Cut out corner pieces from the bottom (as shown in photos). Fold sides in first and place adhesive along the edge of the shorter side and secure longer side by pressing it down on top of the adhesive. Use corner rounder punch to round the corners of the bottom flap. Secure with adhesive. 3. HORIZONTAL: Cut copy paper 7 ½” X 2 ½”. 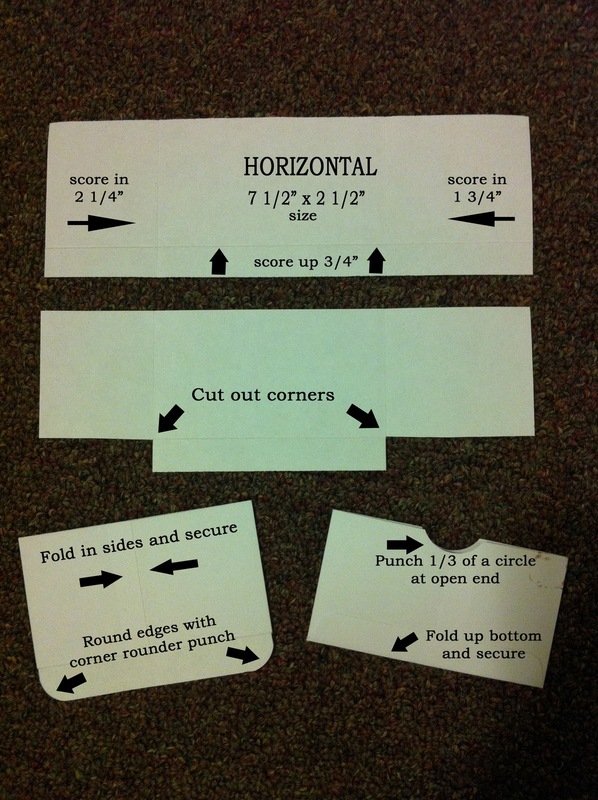 On the long side, score and fold 2 ¼” in from one side and 1 ¾” in from the other side. Score and fold ¼” up from the bottom. Cut out corner pieces from the bottom (as shown in photos). Fold sides in first, then place adhesive along the edge of the shorter side and secure longer side by pressing it down on top of the adhesive. Use corner rounder punch to round the corners of the bottom flap. Secure bottom flap up onto the pocket with adhesive. 4. Using your circle punch, punch part of a circle in the open ends of each “pocket”. DO NOT punch out the entire circle. You want about 1/3 of the circle punched. Punch just enough of a circle so that it creates a “thumb & finger” pull area to grip the card when pulling it out. 5. VERTICAL COVER: Cut a piece of cardstock so it measures 7 ¾” X 2 ¼”. Along the longest side make the following score marks: 3 3/8”, 3 ½”, 6 7/8” & 7”. Make crisp folds along each of your scoring lines. 6. HORZONTAL COVER: Cut a piece of cardstock so it measures 5 ½” X 3 ¾”. Along the longest side make the following score marks: 2 ¼”, 2 3/8”, 4 5/8” & 4 ¾”. Make crisp folds along each of your scoring lines. 7. For both covers: In the small area between the two largest areas, place a glue line. 8. Next, place all of your gift cards into their own pockets and gather the bottom edges so that they are all even. Gently press them into the glue line. Press firmly on the tops of the gift cards to give a little added pressure to secure them into the glue line. 9. Decorate the outside as desired. 10. You can secure the flap with a small piece of Velcro, a button and some string, a snap, etc. DO NOT use magnets for the flap. The magnet could react with the magnetic strip and erase or damage information on your gift cards. You can use a decorative edge punch to punch a piece of coordinating paper and adhere under the flap for an added texture and look. 11. You can add a decorative band to secure your holder closed. Band size will be the same whether you create a horizontal or vertical. Cut cardstock 1” X 5”. Wrap around your holder and secure with adhesive. Make sure you make is a little loose so that it slides on and off easily. Option: you can layer another color onto your band, just cut a coordinating color ¾” X 5” and adhere it to the 1” piece before you fold and secure. 12. 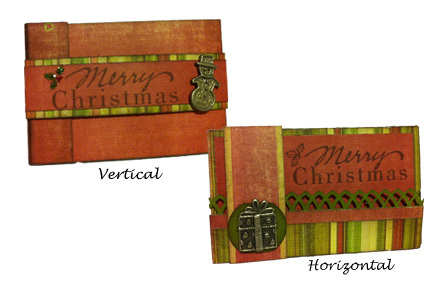 Add a message stamp, embellishments, etc. and you are ready to give your gift cards in style! 1. 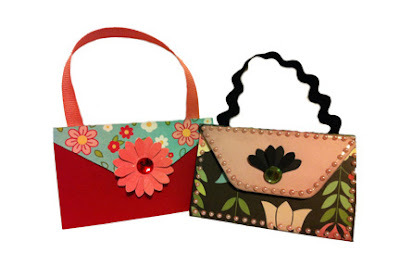 You can turn your horizontal gift holder into a purse by adding a handle and some bling.